A woman has appeared in court charged with attempted murder after a man was stabbed in Barnsley. Ayaan Ali, aged 28, of Isleworth, west London, has also been charged with affray and possession of an offensive weapon and remanded in custody. Ms Ali was remanded in custody to appear at Sheffield Crown Court on 8 October. 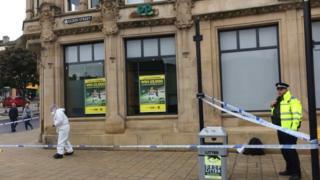 It follows an incident in Barnsley town centre at about 08:20 BST on Saturday when a man suffered minor injuries.